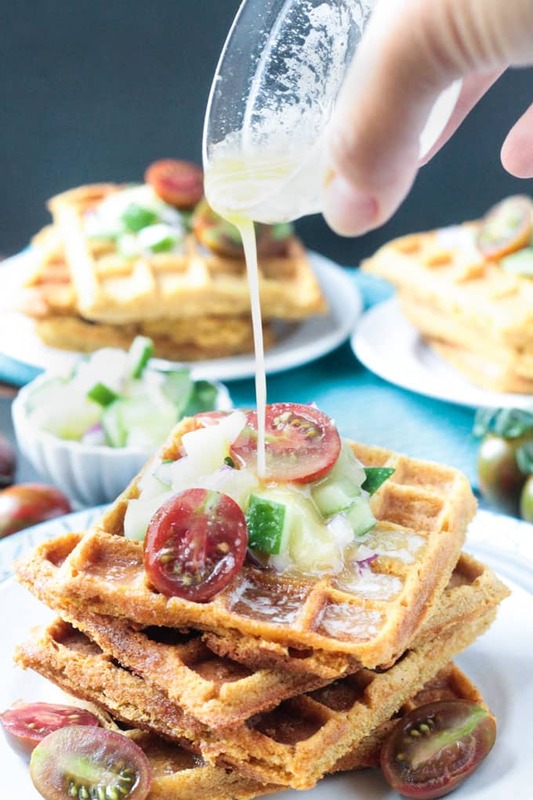 Crunchy Corn Waffles from Bold Flavored Vegan Cooking by Celine Steen – These savory waffles have hints of citrus and just enough spice to tantalize your tongue. I’m so addicted to them! I have a new obsession and it’s these Crunchy Corn Waffles from Celine Steen’s new cookbook, Bold Flavored Vegan Cooking. 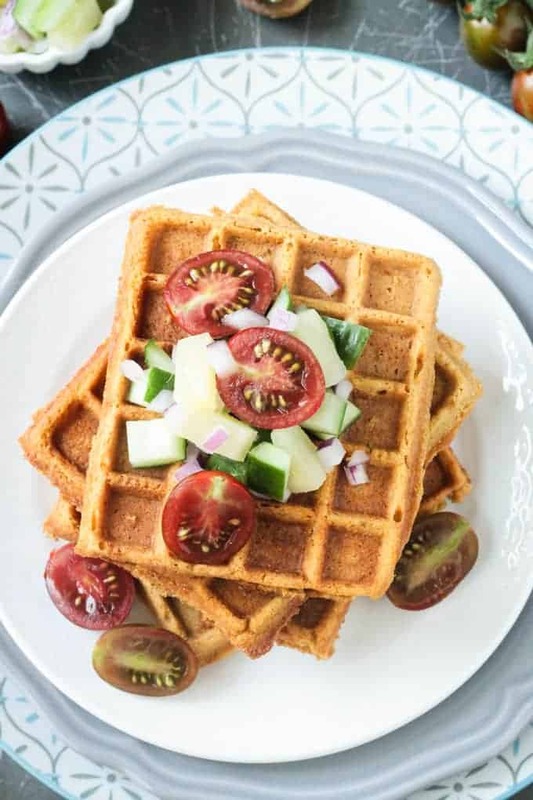 These are savory waffles, but I think they would be just as perfect with maple syrup as they are with the cucumber pineapple salsa I paired them with. With hints of orange and just enough spice to keep things interesting, the flavors are perfectly balanced. The outside is crunchy, while the inside is light. You MUST try these! Keep reading for the recipe, a full review of the cookbook, and a GIVEAWAY for your chance to win a copy. Celine Steen is the blogger behind Have Cake Will Travel. She has co-authored a slew of vegan cookbooks, including The Complete Guide to Vegan Substitutions and Vegan Sandwiches Save The Day, and she did the photography for them all. Bold Flavored Vegan Cooking is her first solo cookbook and it’s a GREAT one! You’ll want to add it to your collection pronto! The book is broken down into 4 chapters – Savory, Spicy, Sweet, and Staples. Here’s a sneak peak at a few recipes you’ll find in each chapter. And as if that’s not enough, Celine includes a section at the end with tips on how you can add big bold flavors to your own recipe creations. She describes the vegan ingredients you should keep in your pantry and where you’ll find them in the most markets. There’s even a list of umami-rich vegan ingredients (And a detailed explanation of what umami is. Hint – it’s your fifth taste). Many recipes in this book are gluten-free, soy-free, and oil-free, and all recipes are clearly marked. You’ll also find many that can be made in 30 minutes or less (hooray!) and those are clearly marked as well. These savory Crunchy Corn Waffles seriously blew me away. I’ve never made waffles before, but this recipe was calling to me and I knew I had to have them. I borrowed a waffle maker from my neighbor, but I’m now convinced I need my own if for nothing but this recipe! You’ll find this recipe in in the Spicy chapter, but the heat is not overpowering at all. It’s perfectly balanced with citrus notes and a bit of sweetness. 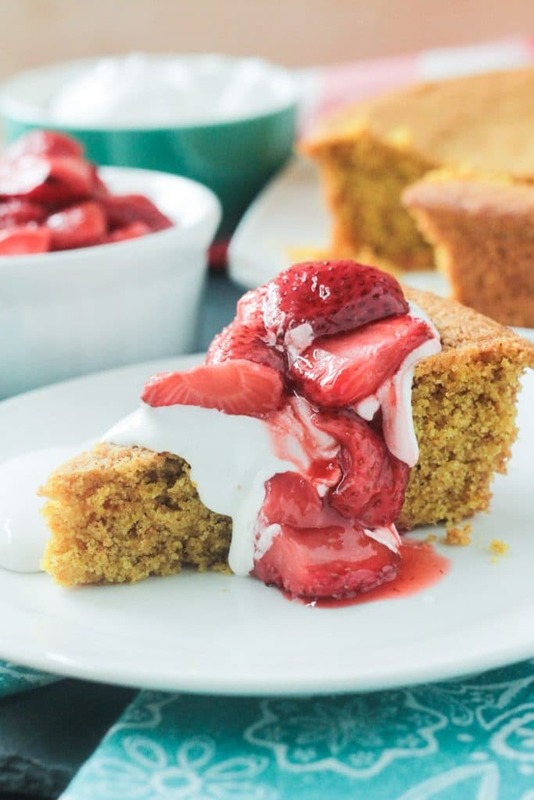 I have always liked my cornbread on the sweet side (like my Pumpkin Maple Cornbread), but from now on I’ll be eating it with a little sweet heat. And you certainly can’t get this amazing crunch with cornbread done traditionally. Turning them into waffles is pure genius! 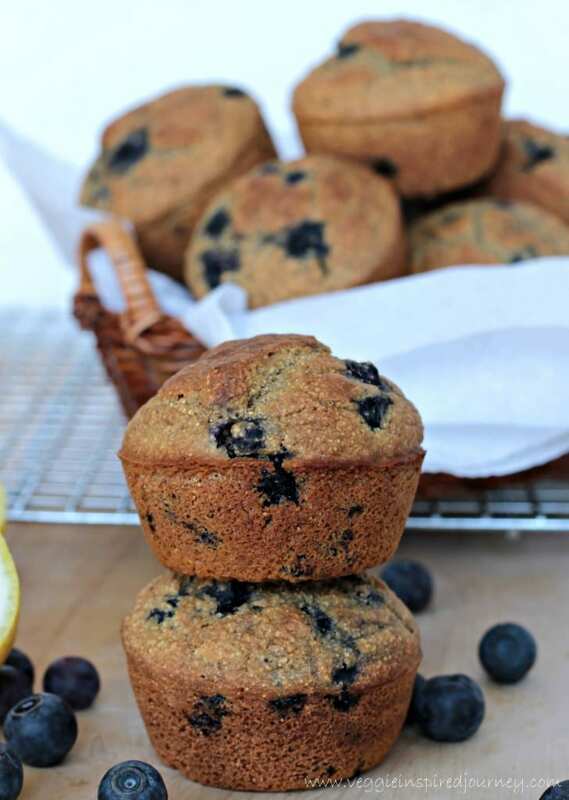 Try them for brunch with the usual breakfast fare. Or make them the perfect accompaniment to chili, soup, or a big green salad. Celine suggests pairing them with her Pineapple Hot Pepper Jelly. I decided to do a lazy version of the pepper jelly and made a fresh pineapple salsa instead – chopped pineapple, cucumber, red onion, and a little lime juice. I added some halved cherry tomatoes on top of all that. And for a touch of added richness, I drizzle a bit of melted dairy-free butter (I used Earth Balance) right before serving. Get a bit of everything on the fork and you’ve got one perfect bite of flavor and texture! I hope you love these Crunchy Corn Waffles as much as we do. If you try them, please come back and leave me a comment below with your feedback. And don’t forget to enter the giveaway below for your chance to win a copy of the book. 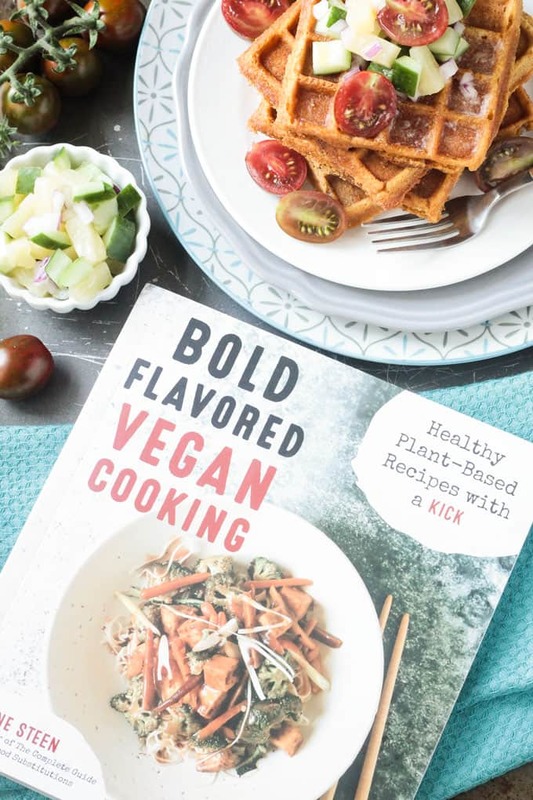 If you want to guarantee yourself a copy, you can order Bold Flavored Vegan Cooking here. Enjoy! Good luck! 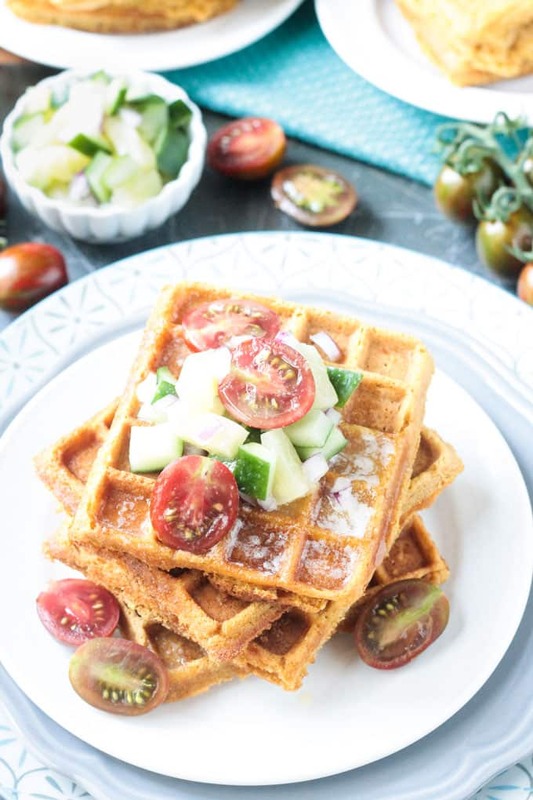 Celine says, "These savory waffles are the perfect vehicle for Pineapple (or Mango!) Hot Pepper Jelly (page 194). They’re also great with Citrusy Pepper Chili (page 116) or a big salad of mixed greens." In a medium glass measuring cup, combine the milk with the vinegar and let stand 5 minutes to curdle. In a small bowl, place the cornstarch and whisk with water to dissolve. Cook in the microwave for 30 seconds, or until cloudy and thickened to a jelly-like consistency. Don’t overcook or the mixture will get clumpy. For guaranteed non-clumpy results, double the amount of cornstarch and water, cook 1 minute, and use ¼ cup (50 g) of the mixture. Discard the rest. Alternatively, do this in a small saucepan over medium heat for about 2 minutes, stirring occasionally. Whisk the cornstarch mixture, salt, Sucanat, oil and orange juice into the curdled milk. Sift the flour, cornmeal, nutritional yeast, baking powder, baking soda and chipotle powder on top of the wet ingredients, and briefly whisk to combine. Don’t worry if a few lumps remain, just be sure not to overmix. thick Belgian waffles on my iron, cooking 4 at a time. Cook until golden brown and crisp. It usually takes 8 full minutes on my waffle iron heated to 400°F (200°C). Transfer to a cooling rack and repeat with the remaining batter. Reheat in a 325°F (170°C or gas mark 3) oven until crisp again, about 10 minutes. Wow, these look so yummy! My dad used to make us corn pancakes! Gotta try the waffle version!!! Corn pancakes also sound fabulous! You would definitely love these waffles! Green Chile goes in or on everything! I agree, living in NM, we almost HAVE to add green chile to anything and everything. Red chile too! So good! I also often add more flavor with a squeeze of lemon, or adding basil or cilantro, even to items you might not think of, like fruit. Sounds delicious! I love unexpected flavors. When I’m feeling a bit lazy I use Mrs. Dash! I like to add a small pinch of fine sea salt after every addition of veggies as I add them to the pot. The finished dish never ends up too salty ! I make cornbread waffles often. We cover them with spicy black beans, spinach, and tomatoes. These look delicious, Jenn! These look so good. BEAUTIFUL photographs, too! When appropriate I like to use cilantro in cooking. I’m one of the people who love it! It’s my understanding that cilantro tastes like soap to some people. In that case I wouldn’t like it either. My mom loves beets but to me there is always a dirt flavor with them so no thanks! Yes, that’s exactly how it used to taste to me. I’m just lucky my tastebuds changed. I like beets ok…with certain other flavors. My mom makes a Polish beet soup, however, and I can’t even be in the house when she’s cooking it because of the smell, let alone eat it! Ha! Smoked sea salt in waffles? Color me intrigued! I loved the recipe for kimchi fried rice that I made from Celine’s book. I need to pull it back out for these waffles. They sound like the perfect addition to Saturday brunch. I’ll admit the smoked sea salt doesn’t really come through…regular salt would be just fine. BUT I do think a little smoked paprika would be awesome in these too! I’m loving the crunchy factor in these. Nothing worse than soggy waffles, yuck! I’m always on the fence when it comes to sweet things that are savory versions but these sound delicious! Never had savory waffles before but this looks like an excellent place to start! What a great idea! Definitely a great place to start! Thanks, Greg! Love how awesome vegan cooking is. You really can make such flavorful and satisfying meals that are vegan-friendly – without anyone even knowing any different! I LOVE cornbread so I bet I would love these corn waffles too. They look so perfect. I couldn’t agree more! Thanks, Ashley! Wow – looks like a fab book. What a tasty treat to make. I need this book in my life. I love big, bold flavours! I also love waffles and have never eaten a savoury one. I think I need to change that. They look awesome! You would love it, Mel! I love this savory waffle more than any sweet one I’ve ever had! Looks like another great recipe I need to check out from this book! If you haven’t tried it yet, the Smoky Kale and Chickpeas are really good! I shared that recipe on my blog. I’ve got my eye on those too! So many recipes I want to try! It really is! The flavors are perfect! Thanks, Dahn! Now this is a creative waffle! I need to try them out very soon! I also must check out this cookbook! You’d love it, Kristina! Thanks! i love cornbread but never thought of making in a waffle maker. Perhaps i should purchase one ….. I can see why these are addicting! 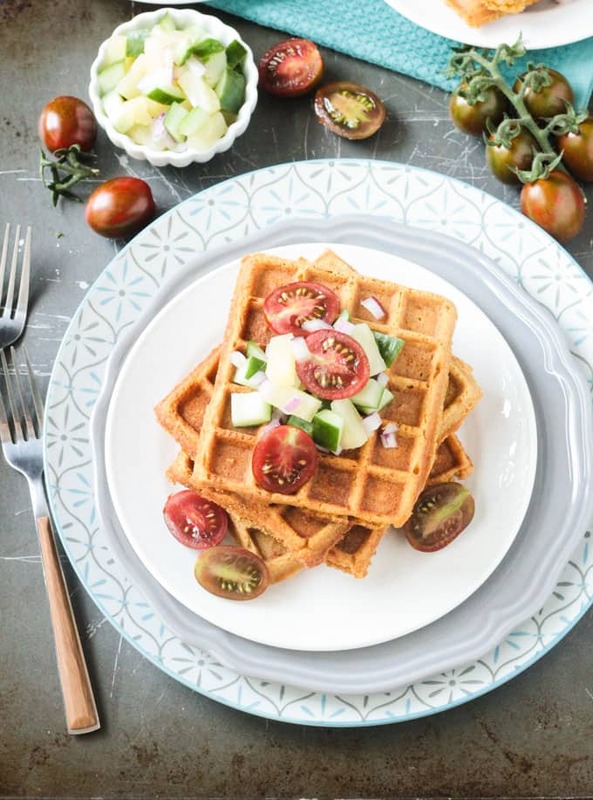 The flavors in these savory waffles sound perfect! Need to make asap! Great savory twist on waffles! I’m keeping this one in mind the next time the girls want waffles for dinner! They’d be perfect instead of rolls or bread…or just as the main dish too! Savoury waffles are a secret love of mine! 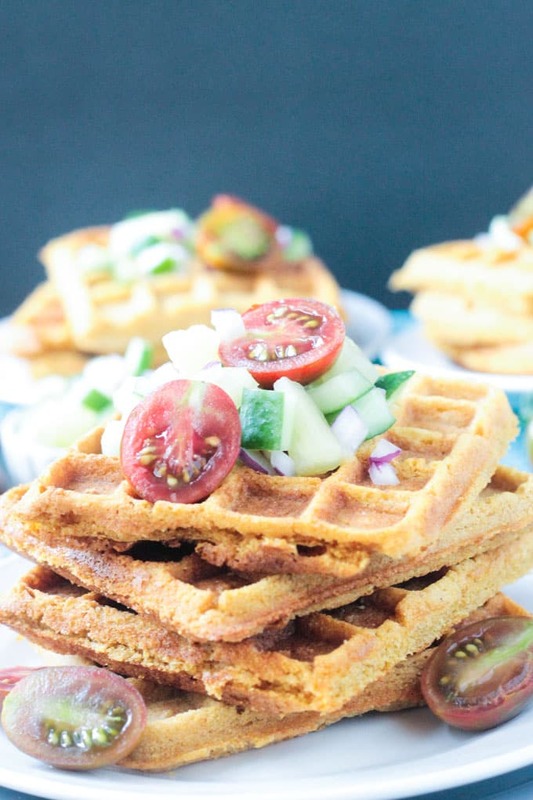 Love the idea of these crunchy corn waffles, and its a bonus that they are vegan! Am definitely saving this for the weekend. Oh, you will love them for sure. I think I’d take savory waffles over sweet any day. For sure! Tell her to enter the giveaway too and hopefully she’ll have a great cookbook for her shelves! I am always in the mood for waffles! I will definitely try making this over the weekend! Great! Can’t wait to hear you think. Vegan cornbread in waffle form?! Sign me up! That cookbook looks amazing too! I know, right? They’re amazing! Thanks, Laura! It’s such a great book! Thanks, Amy! 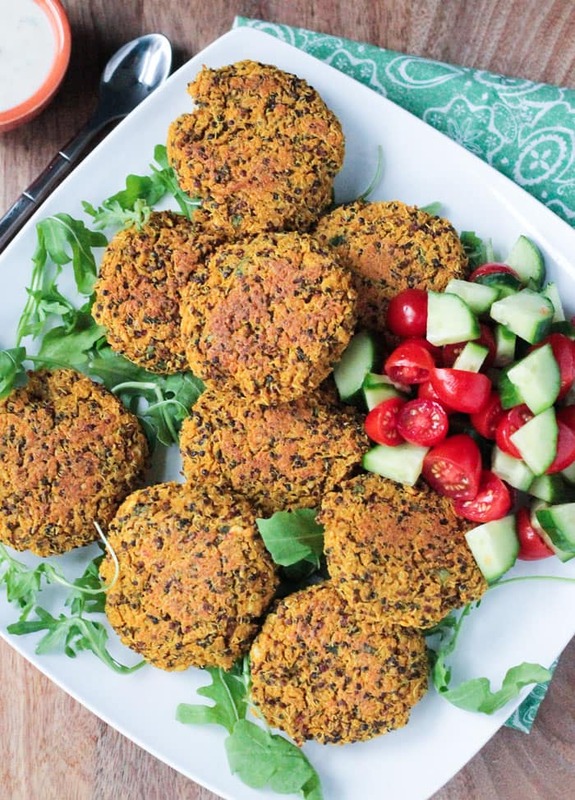 I’m not much of a vegan (at all), but these look absolutely delicious. Vegan Wednesdays for me then! Oh, these are definitely for everyone who loves delicious food! Oh my gosh, these look gorgeous! I’m loving Celine’s book but haven’t made this recipe yet. Gotta correct that, ASAP! You will love these! Like super crunchy cornbread! Those look so perfectly crisp and flavorful! I’ve always love Celine’s recipes – they’re inventive, but doable. And I love the toppings you put on the waffles Jenn – it plays so nicely on the savory theme. Thanks, Alisa. I totally agree about Celine’s recipes – creative, but not intimidating. I’ll definitely be reaching for this book a lot! These look amazing! Love the savory twist. Have to make these for brunch very soon! Yum, these sound awesome. I’m on a huge waffle kick so can’t wait to try these! I hope you love them, Deryn! I love this cookbook! I haven’t made this recipe yet, but now I need to try them! Yes, you need to. I’m obsessed! Not usually a waffle person, but these look interesting enough to dig the waffle iron out of the basement. I think I might like the cookbook, too – Pineapple Hot Pepper Jelly sounds very intriguing! I’m not really a sweet waffle person most of the time, but THESE savory waffles are amazing! I really can’t stop eating them! Me too – especially straight from my backyard garden! These waffles look great – I’m going to need a waffle maker too! One of my favorite ways to add flavor to a dish is to cook with miso. Miso is such a great ingredient. And you are going to love these waffles! Spice! Adding spices to any meal makes it better.